Black and White and Loved All Over: Stuff I Made: Patchwork Curtain + Bathroom Dreams. Stuff I Made: Patchwork Curtain + Bathroom Dreams. Hi! My room project of the moment is our bathroom. 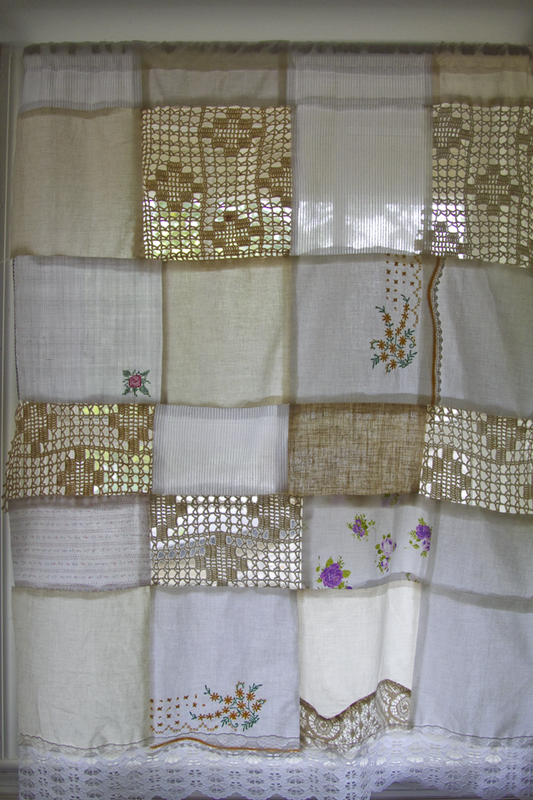 I made this patchwork curtain for it on Friday out of scraps of white and ivory and handkerchiefs and lacy/crochet stuff I had. 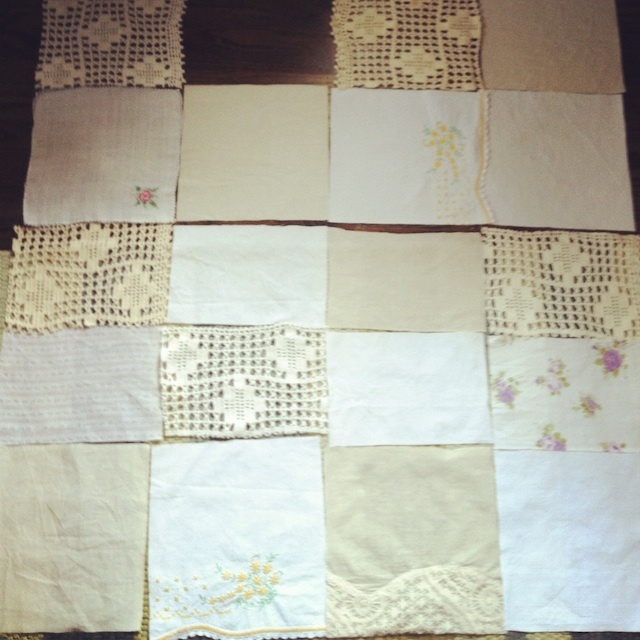 One of those handkerchiefs--the one with the red embroidered flower--I've had since I was a little girl. I remember finding a baby bunny and using that handkerchief as its blanket. Pretty sure that baby bunny was smothered by my well-meaning love long before it had a chance to grow big and strong and hop off somewhere more suitable for a bunny. This curtain is wonky in all the right ways. Just about all the stuff I make is. I'm grateful that I'm not a perfectionist about my sewing. Otherwise I'd never get anything done. I also recently bought this shabby-chic-to-the-max old hanging shelf from local shop Old Made Good and hung it in the bathroom to hold perfumes/colognes and favorite lotions and serums and stuff. 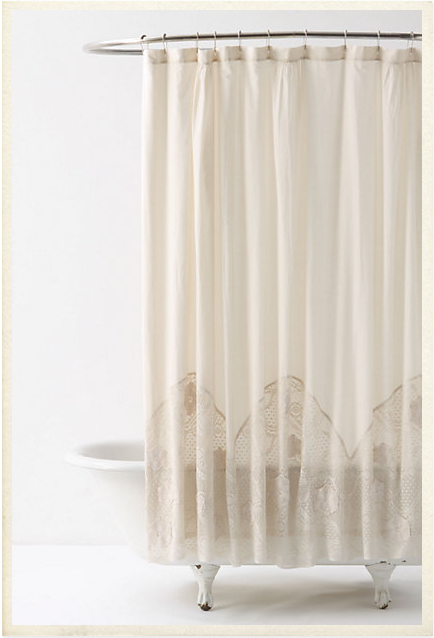 And I bought this shower curtain on sale at Anthropologie. Now I'm trying to convince Nekos that it's a good idea to paint the bathroom a deep turquoise, like the bathroom below, and I'm looking for an old mantle to put in the bathroom. For years, I have been dreaming about ripping out our plastic tub and putting in a clawfoot soaking tub. I really like this one. I literally take a bath almost every night before bed; it's part of my relax routine since I can't anesthetize my monkey mind with sleeping pills because I'm pregnant and all. My bath tub dreams remain on hold, however; we are really trying to save money so we can afford for me to take a short maternity leave from work in December. In the meantime, little changes make a big difference. Speaking of the baby, we find out what we're having on Wednesday! Meaning, the next home project will be the new nursery! Paint it! 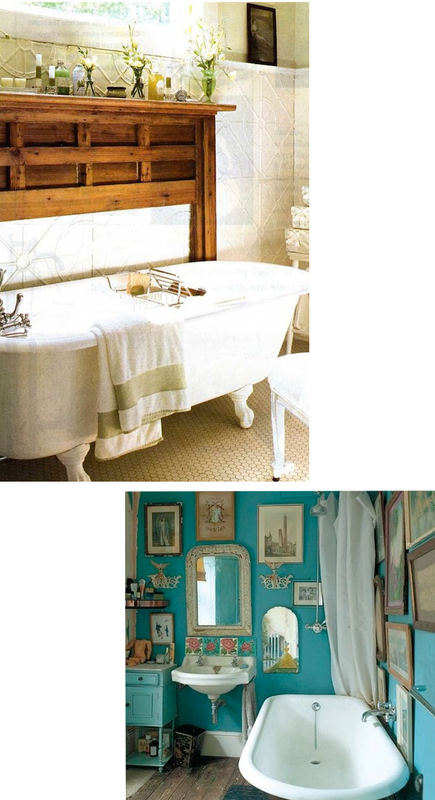 You will love it, my turquoise bathroom is still one of my favs in my old house. I'm wanting to paint the soon to be new powder room crazy pink :) hope you are doing great! 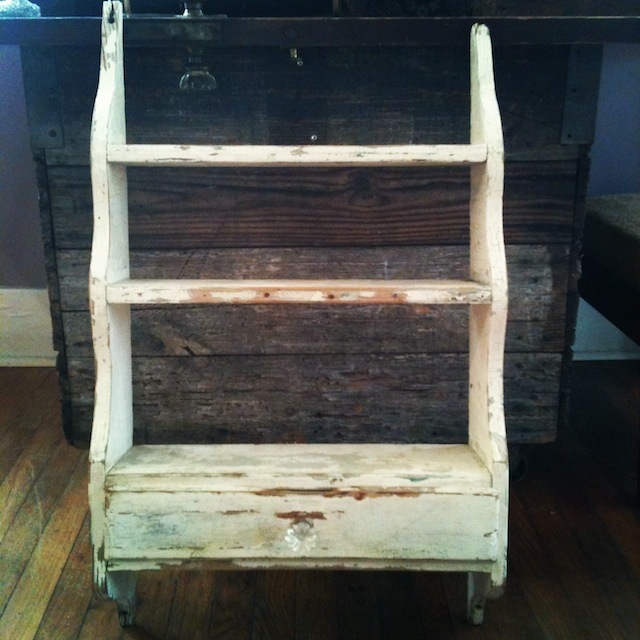 I really love the shabby chippy old shelf you found. Great score! I am one of the lucky ones with a clawfoot. I've only taken a bath in it once in seven years. Do you want to kill me? I just prefer showers, I guess, but I do LOVE how beautiful they are. :) Keep on nagging about the turquoise, I think it will be grand!! Curtain wire or wooden dowel (can be purchased from curtain store or home change store).